Want to check out Splatoon 2 but haven’t had the chance? Nintendo’s got a whale of a deal to help new players test the water. 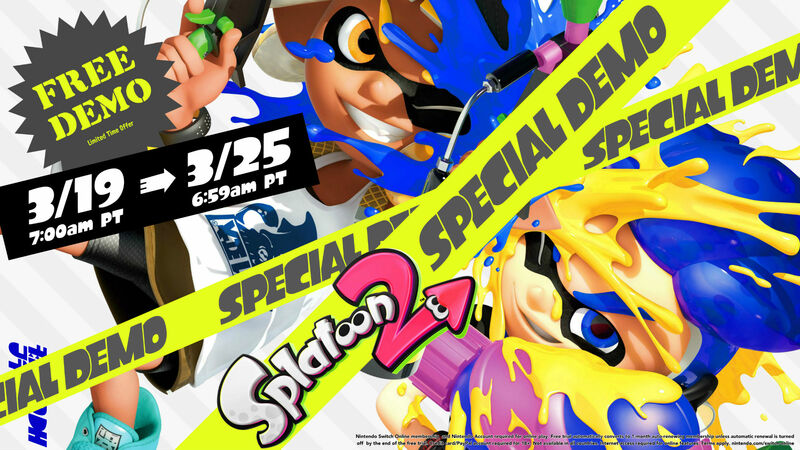 Nintendo Switch owners with an online connection and Nintendo Switch Online membership can join in the Splatoon 2 Special Demo from now through 6:59 a.m. PT on Monday, March 25, 2019. Demo users will have the chance to check out 4-on-4 Turf War battles as well as Salmon Run, League Battle and Ranked Battle modes online with friends and other players who own the full game. The Splatoon 2 Special Demo is available in Nintendo eShop for Nintendo Switch. After downloading it, players will receive an email with a Nintendo eShop code to activate a seven-day free trial for Nintendo Switch Online. Players can use the code even if they’ve had a previous free trial. Those who purchase the game during the demo period will receive a 20 percent discount and will be able to transfer their demo progress over.